The Spain food that is served across the country has some similarities, but does differ by region. 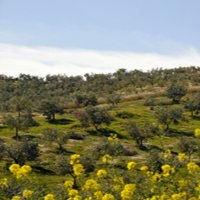 The south region, Andalucía, has some great food traditions. Because it spans across a diverse region, so does its cuisine. One side of the country is the Mediterranean and the other, the Atlantic ocean. 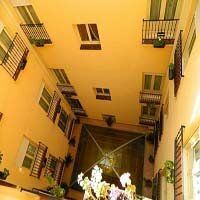 Then throw in olive groves, hills, mountains and valleys…you can only imagine that it’s great fun to savor all the spain food delicacies this region has to offer. Tapas, sometimes called Pinchos, are small dishes that are available in tapas bars and many restaurants. It’s a very common way that Spaniards eat. It originated in the Andalucía in the 19th century and was meant to be eaten with Sherry. They were once free, but not anymore. There are many varieties of uniquely prepared meat, vegetables, or seafood dishes. These dishes are meant to be shared and make a great light meal or heavy meal, depending on your desires. Each tapa bar is usually known for its particular specialty of spain food. They are usually best accompanied with dry sherry or a draught beer. Try tapas with my favorite beer Cruz Campo! Because of its vast coastline, southern spain (or all of spain) has great seafood. The variety includes cod, hake, prawns, crayfish, clams, razor clams, octopus, cuttlefish, tuna and sole. Seaside restaurants offer pescaito frito, fried fresh fish. Sanlucar has great langostinos, king prawns that are sweet and spicy. It’s no secret that Pork is the meat of choice for Spain food in Andalucia! Maybe you’ve heard of the hams of Jabugo and Travelez. They are some of the best made in Spain. These specialties are made with black footed pigs that are free range and live on a diet of acorns. They are the pride of this region. Chorizo is a sausage made with smoked paprika and garlic that is a regional favorite. Southern Spain has a great hot climate for fruits and vegetables. They include tomatoes, papayas, peaches, mangos, oranges, asparagus, eggplants, artichokes and persimmons. And don’t forget the olives! Chocos con Habas – Cuttlefish cooked with white beans, white wine and bay leaves. Rabo de Toro – Chunks of bulls tail, simmered with vegetables, bay leaves and sherry. 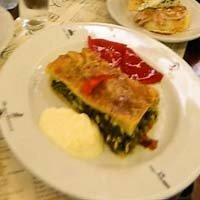 A classic Andalucía dish! Salmorejo Cordobes – Creamy tomato dip thickened with breadcrumbs. Pato a la Sevillana – A specialty of Seville, duck cooked with onion, leeks, carrots, bayleaf and sherry. Tortilla de Sacromonte – A specialty of Granada, omelet of brains, kidney, peppers and peas. If you don’t know Spanish, you might be able to figure out what some of the tapas are, and others might get confusing. I think tapas are the best way to eat every day. 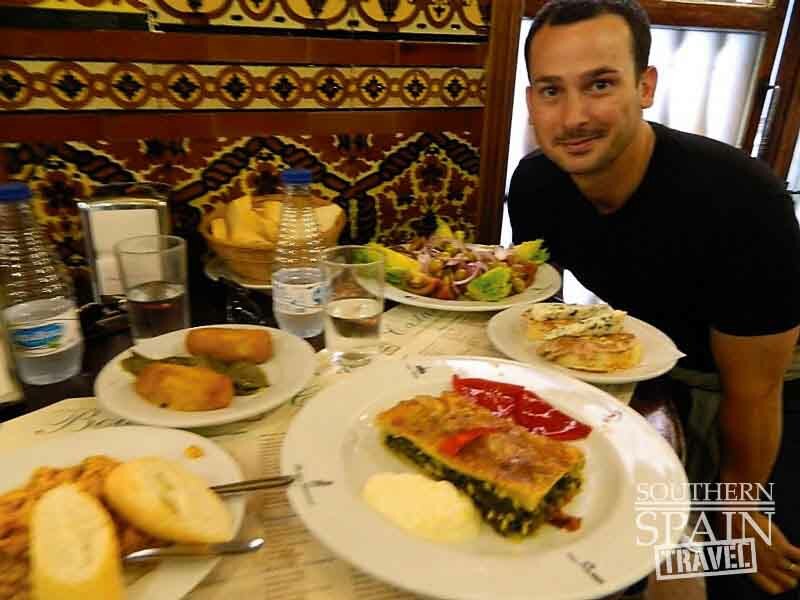 It’s a great way to sample the regional cuisine and its fun every time!Sure, you could hit up a pizza place or fast food, but that would defeat the point of being in Spain! Their food has a rich history and must be savored! Patatas Bravas – Fried potato chunks with a spicy red sauce. Alternatively, if you prefer something more creamy, the Patatas con Aioli is potatoes with a garlic mayonnaise and is seen quite frequently on menus. Calamares Fritos – Fried squid rings and tentacles. Deep fried in olive oil, they have a light flour batter and usually served with a lemon wedge. Jamon Serrano – Salt cured ham. It’s dried in the mountain air (Serrano air). The pigs are fed a diet of acorns, which gives it even a more unique flavor. Queso Manchego – Sheep’s milk cheese from La Mancha. Tortilla Espanola – Omelet made of potato, onion and eggs, usually served in a large wedge or several small bit size pieces. Chorizo – Sausage flavored with paprika and garlic. It is eaten both cold or fried and served warm. Salpicon de Mariscos – A cold salad of fresh seafood in a vinaigrette. Pollo al Ajillo – Small pieces of chicken wings sautéed and simmered in a garlic sauce. Albondigas – Meatballs served in a spicy tomato sauce, sometimes served without. Mixed Green Olives - Olives stuffed with almonds or more commonly anchovies are served at almost all tapas bars. Banderillas – Canapes skewered on toothpicks, meant to be eaten all at once. Boquerones al natural – Fresh anchovies in garlic and olive oil, can be served fried. 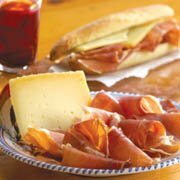 Here are some popular Spanish food recipes.